It has long been reported that Trump whisperer and white nationalist Steve Bannon has a whiteboard in his office, on which he meticulously lists his priorities. But until yesterday, few people outside the Trump inner circle knew what was on it. 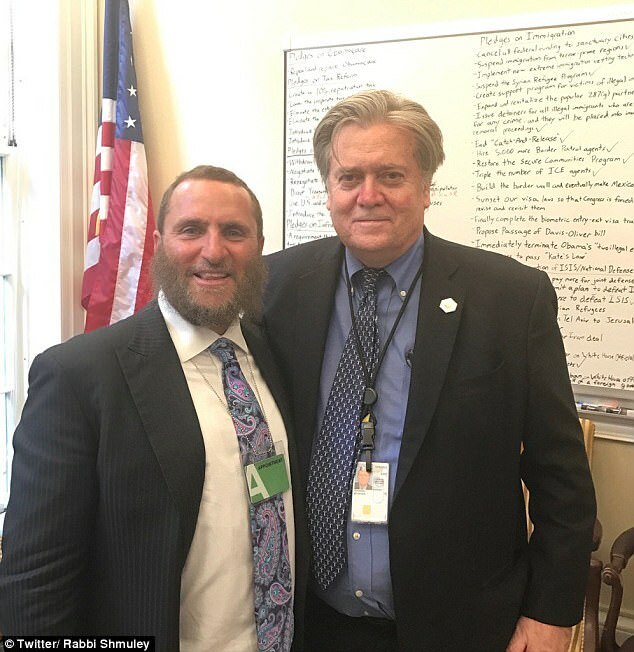 Now we know, courtesy of a selfie taken in front of the whiteboard by self-proclaimed “America’s rabbi” Shmuley Boteach. What we see behind Boteach and his (strangely) good friend Steve Bannon are dozens of bullet points—some with check marks next to them indicating success—laying out the Bannon-Trump agenda. Many are not surprising: “Build the wall and eventually make Mexico pay for it,” for example. But others are chilling confirmations of our worst fears about what these guys are up to. They’re not surrounded by self-negating air quotes. They’re not random thoughts. They are carefully written and organized—a battle plan for the devolution of American democracy, the institutionalization of xenophobia, and the dismantling of essentially everything that has expanded rights and contributed to a fairer shake for disadvantaged Americans. I suspect that Bannon is not ashamed at all of what is on the whiteboard. But I do think that he and other Trump whisperers–who have demonstrated an unwillingness to openly discuss what they’re doing or to take responsibility–are at least slightly unhappy that the whiteboard list has been outed inadvertently. -Sunset our visa laws so that Congress is forced to revise and revisit them. There’s nothing on this list about Social Security, Medicare, Medicaid, Unemployment benefits, voting rights, Supreme Court nominees or any other New Deal programs that Bannon-Trump and the radical Republican party are bent on destroying. It makes you wonder if there’s another whiteboard somewhere–either in the real world or in Bannon’s brain–with the rest of the nasty agenda. We can only hope that another narcississtic toady wants a selfie in front of that list, too.